Xavier Rudd is an Australian folk artist. He plays many instruments, and he shines on the Didgeridoo. Here is a live concert from 2004, a perfect showcase of Xavier’s talent. My particular favorite is his song Let Me Be, a tune I’ve had stuck in my head for years now. 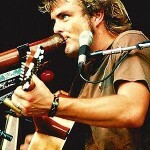 This entry was posted in Music and tagged Acoustic, australian, didgeridoo, Folk, singer-songwriter by bahgheera. Bookmark the permalink.